Simple and delicious, roasted chickpeas are a staple in my fridge. They have a great texture and can be spiced to provide added flavor in soups, salads and side dishes. Roasted chickpeas are also great alone as a crunchy, gluten-free snack. 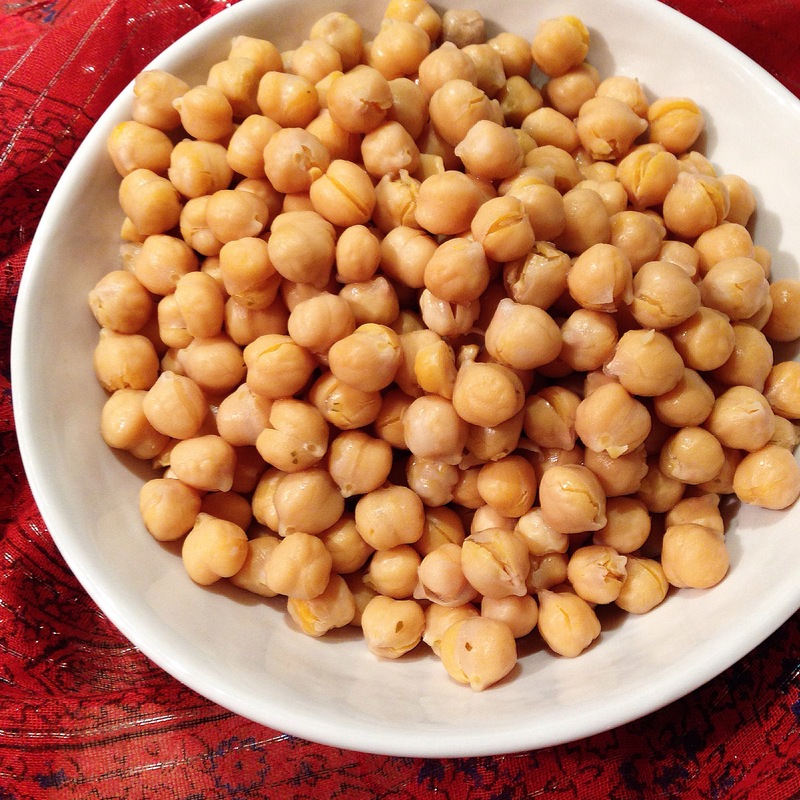 Garbanzo beans are vegan and packed with quality protein and loads of fiber. They’re a good source of iron, magnesium, zinc and other minerals, as well as a range of B vitamins and healthy fats. In Traditional Chinese Medicine garbanzo beans are considered beneficial to the pancreas, spleen and heart. Canned Chickpeas vs. Dried Chickpeas – If you have time to rinse, properly soak (12 hours to remove most of the anti-nutrient phytic acid) and properly cook (upwards of 2 hours) dried chickpeas, AWESOME. This option is by far the most cost-effective. Shopping in the bulk section of organic markets makes buying organic much more accessible to those on a budget who also value non-toxic eating. It does take more time but using dried beans ensures that they are properly handled while also reducing the cost significantly. When you have the time and have done some planning, this is definitely the way to go. However, there are most certainly going to be days when you have nothing prepared and you’re just proud that you didn’t stop for fast-food on your way home (and you should be proud – good job!). But now you need food, and fast. Canned beans are a very important go-to for healthy eating. IF they are good quality, that is. Eden Organic’s canned beans are the only ones I purchase. They provide more transparency as a brand than I have found with others – you can check them out here. They soak the beans, use toxin-free can linings, do not cook the beans in the can, or use any nasty preservatives and they are organically grown and certified. I always have a couple of cans of Eden’s chickpeas in the cupboard for quick healthy meals. Allow the chickpeas to sit in the strainer for as long as possible to remove as much water for crispier chickpeas, alternatively you can pat them dry with paper towel. It will take longer to cook them if you do neither – skipping this step will not save time overall. Put the chickpeas into a bowl, add oil and stir well. Add spice blend and a bit of salt and pepper. Stir well to coat. Line a baking sheet with parchment paper. Stir chickpeas again and pour onto the baking sheet in a single layer. Give a bit of space between the beans, if possible, just for more even cooking. Sprinkle with salt and pepper and put into the oven. At 15 minutes remove the chickpeas from the oven – flip, turnover and rotate the chickpeas. Return them to the oven. At 30 minutes repeat the last step and ensure that the ones on the edges are not getting too dried out or burnt (ovens always vary). There is some individual preference options here. I prefer my chickpeas a bit chewier most of the time, so at about 40 minutes I remove mine from the oven. I suggest that you try one (careful it’s hot) at 40 minutes. They will get a bit crunchier as they cool and dry. I have left mine in for 60-70 minutes, and they got really crunchy, which was good in it’s own way. Experiment. Regardless of what time you take them out, let them cool completely on the baking sheet. Once cool, add them to your meal or pickup the parchment paper , making a bit of a funnel, and pour them into a jar for later. Store in the fridge for use throughout the week. Next Post Chai Spice Protein Elixir with colostrum, grass-fed butter and MCT oil. i am so going to try these next time i bake, thanks for sharing! I finally baked and I can’t stop eating them! I used chana masala spice blend instead. Thanks for sharing! Awesome! They are highly addictive little guys 🙂 thanks for reading and have an amazing day!